Cañero Single Malt Finish is a blend of rums aged for 12 years in a solera system and finished for an extra 6 months in Ben Nevis Single Malt bourbon barrels. Cañero Single Malt Finish is a blend of rums aged for 12 years in a solera system and finished for an extra 6 months in Ben Nevis Single Malt bourbon barrels. The blended rums come from the Dominican Republic and have been matured in Bourbon barrels. The blending was operated by the famous Cuban Rum Master Juan Alberto Alvarez. The flavours of rum and whisky are masterly mingled in this Cañero edition: this rum reveals a very refined nose with sweet notes of almonds and nuts over a vanilla background. The generous oaky texture coats the palate and refreshes as well with a nutty, sugar cane finish. Cañero is a tribute to the Dominican farmers who have been cultivating and harvesting sugar cane for generations. 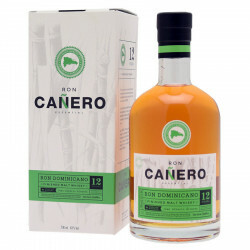 It is in this spirit and in the respect of Cuban-Dominican traditions that our Cuban master Juan Alberto Alvarez has developed Cañero, rum of Spanish tradition but distilled from the pure juice of sugar cane grown in the Dominican Republic, and aged rigorously according to the traditional Spanish method of solera.Launched. in 2014, under the brand name Summum, Cañero strongly claims its Dominican origin, a country much better known as a tourist destination than for its rum. And yet, it is where one of the first written records of a sugar cane crop in 1515, the year that saw the export of sugar to Spain. It was Christopher Columbus himself who planted the first seedlings in December 1493. But it was not until the middle of the 18th century that the rum was really established. There were 173 distilleries in 1791 and even ten more in 1806. The figure will then continue to decline until today when only two companies are still active on the island, including Brugal, which produces Cañero in one of its three distilleries established in the Dominican Republic whose name is Yazoo. Selected and assembled by the company Caribbean Distillers, Cañero is a rum made from pure sugar cane juice. A real peculiarity in a region that favours the tradition of Spanish tradition. Moreover, the creator of Cañero, Juan Alberto Alvarez relies on the Solera technique for the aging of his spirits. This system, popularised by Spanish sherry, had been imported to Cuba in 1872 before being also used in the Dominican Republic after the Castroite revolution. Nose: elegant, with sweet almond notes. Palate: delicate and mellow with vanilla and nutty flavours, over an oaky texture. Finale: lingering, refreshing, with a nutty and almond finish.